So today is a big transition day for me. I’m stepping out of a role that I’ve filled since the first part of July for one client and out of the business entirely of being a virtual assistant. I’ve enjoyed filling this role and being in this business, but the reality is that it was a place to hide out and be comfortable. In my last post, I mentioned that I was hiding from a call of God on my life. I’ve taken a few steps out of my hideout in the last few weeks, but today is a big step. It’s a weird feeling. But my favorite of all is the group designation for rhinos. You see, rhinos can run at thirty miles an hour, which is pretty fast when you consider how much weight they’re pulling… Just one problem with this phenomenon. 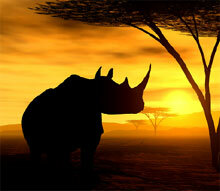 Rhinos can see only thirty feet in front of them. Can you image something that large moving in concert as a group, plowing ahead at thirty miles an hour with no idea what’s at thirty-one feet? You would think that they would be far too timid to pick up full steam, that their inability to see far enough ahead would paralyze them to immobility. But with that horn pointing the way, rhinos run forward full steam ahead without apprehension, which leads us to their name. Rhinos moving together at full speed are known as a crash. I’d put aside my rhino mentality for at least two years, but I’m picking it back up. I’m no longer willing to hide out, but rather I’m picking up steam and moving forward without apprehension. Join me and let’s become a crash. Excited for you and your next steps!